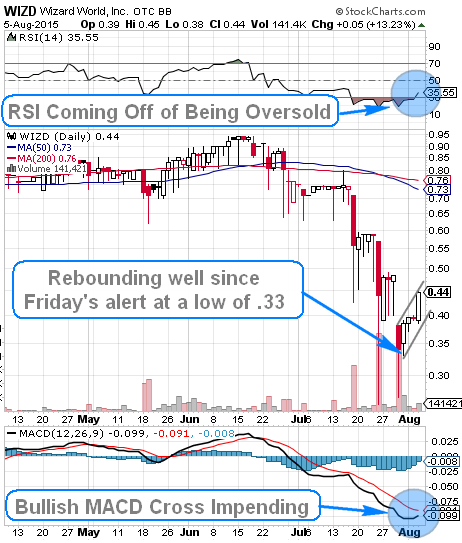 We want to provide an update on WIZD as we kick things off this morning, but first a quick memory-refresh; we called this stock as a bottom-play on Friday, July 31st after noticing it had been beaten back to new 52-wk lows just prior to that. On that day, we observed a low of .33, and WIZD did an excellent job of sustaining a recovery throughout last week, during which we provided multiple updates. The chart continues to exhibit a bullish look, as we’ve pointed out on the following snapshot. Ideally we’d like to see the stock hold support at .48 on any pullbacks, and below that, .45. We’ll have it on steady watch as trading for the week commences. Apple, Inc. AAPL - On Friday we were mentioning our interest in AAPL Weekly $115 Calls, and the trading action that ensued was quite noteworthy. We were witnesses to an initial pop of 207% (.43-1.32), followed up by a pullback to .74, and subsequent spike to its high-of-day at 1.44, good for an added intraday move of 95% That was followed by several lesser, yet still significant swings; from .28-.54, .20-.45 and .20-.62. First Solar, Inc. FSLR - Similar volatile trading action in the FSLR options we specified occurred on Friday (Weekly FSLR $51-52 Calls.). Several opportunities were there for the taking as those contracts all made healthy primary runs followed by multiple dips-and-rips. The $51 Calls ran 170% from .63-1.70, and again from .76-1.10 (+48%). The $51.50 Calls first pop carried them from .34-76 (+124%), and later it registered added swings from .18-37 and then from .05-.19 in last hour of trading. Finally, the $52 Calls took off on a 163% rip from .38-1.00 , and managed an extra move from .24-.60 in the last hour. Also on our watchlist to start things off today will be Value Setters, Inc. VSTR. Blue Horseshoe Stocks: Celebrating Four Great Years! We’ve been going heavy on our options tracking this week, and have unearthed some real gems as usual. To close things out today, we’ll identify a couple of things to watch for once action commences. Apple, Inc. AAPL - To reiterate our AAPL idea, we were tracking the stock and observing for a bottom early this week, which it found Wednesday. It led to some impressive gains in the Weekly $115 Calls, and those are the contracts that we’ll watch for added activity. *Remember: Trading in options with a weekly expiration on a Friday carries an elevated risk/reward dynamic. First Solar, Inc. FSLR - Earlier this week we saw intraday gains running from 188-579% from our FSLR ideas. We’ll roll our previous tracking range ($47-50.50) on Weekly FSLR Calls up to the $51-52 Level. FitBit, Inc. FIT - We’ve witnessed gains approaching the 100%-mark from Weekly FIT Calls in prior sessions, but today we’re going to enter a longer-term idea into the log for extended observation. We’re interested in the FIT September 18th $64 Calls. 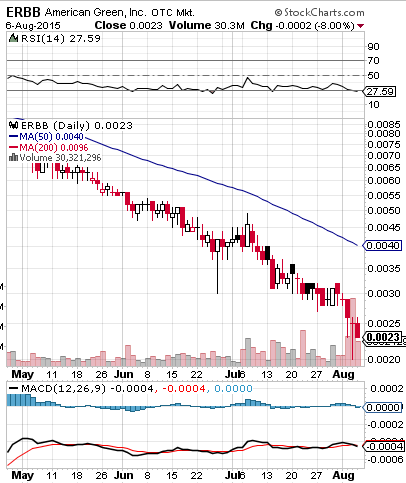 As you can see from the side-by-side snapshot below, each of these .0008-stocks appear ready to rebound off of their recent relative bottoms, and we’ll want to be paying close attention when they do. Especially in the case of PVSP; a play that we tracked over a monster run from late-June, early-July. We’ve been familiar with this stock since back when it was still trading as Tranzbyte Corp., although 2015 has been a near-constant downslide for the stock. One look at the chart and it’s self-evident. It did however, respond to the logging of a new 52-week low on Wednesday with a higher low for yesterday’s session, so we’ll want to see if it can continue to establish a higher base of support. A rebound could be forthcoming at any time, so we’ll re-submit this to our running watchlist. Today we are celebrating the 4th anniversary of Blue Horseshoe Stocks. It’s been a great ride so far, and we can’t wait for all the great things the future holds! Our thanks go out to our many valued subscribers and readers from around the globe for your continued support! Without you we’d have no reason to do what we do, so, Happy Birthday to the entire Blue Horseshoe Stocks community, one and all! We’d like to start things off this morning with an update on a stock we’ve been tracking since the end of last week. 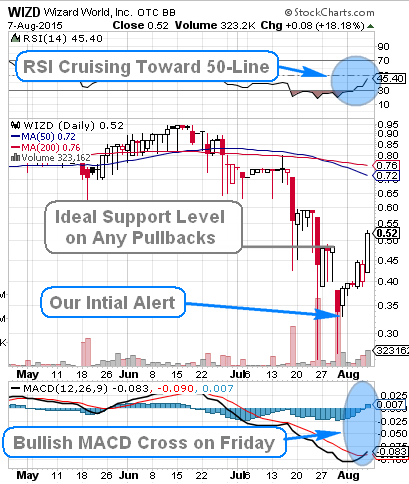 We introduced WIZD in Friday’s premarket report, presenting it as a potential bottom-play. We noticed that it had recently been crushed down to new annual lows, and drew up a chart to illustrate the opportunity. Over the last few sessions the stock has done a good job of building a higher base of support and regaining some of the ground it lost this summer. Yesterday it attained a daily high of .45, which marks a 36% upswing over our observed low. We’ll want to see WIZD continue to make a healthy recovery, ideally holding support above .40 on any pullbacks. The stock was trading up close to a dollar as recently as June, and a return to those levels from current pricing would mean gains approaching 100% The chart is still bearing the look of potential, as you can see a number of bullish indicators on the snapshot below. First Solar, Inc. FSLR – Yesterday we identified a couple of potential options ideas, and one of them provided several chances for lucrative intraday trades. Our targeted range was the Weekly $47-50.50 Calls and while every set of contracts within did make increases, for time’s sake we’ll just highlight some of the top gainers. The 47.50 Calls surged 188% from 1.91-5.50. The $50′s traded in a range from .63-3.15 , a whopping 400% jump, while the $50.50 Calls had the biggest day with a run from .38-2.58, an amazing 579%. The $50 Calls traded as low as 2.19 on Tuesday and reached a high of 4.40 yesterday (+101%). The $50.50 Calls went from 2.14-4.10 (+92%), and the $51′s jumped from 2.00-3.85 (+93%). After getting beat up on the heels of that earnings report, this morning we’ll watch for chances with the FIT $45-48 Calls. Apple, Inc. AAPL - We also want to make mention of AAPL, which we’ve been following this week via our extended watchlists, and in our traders chatroom*. After a period of consolidation, we were awaiting an AAPL rebound, and yesterday we got what we were looking for- big moves occurred in the Weekly $115-116 Calls. Moving forward, we’re going to be on the lookout for the possibility of added gains in those plays, especially heading into tomorrow when they close in on expiration. *It gives us the opportunity to remind our readers that anyone wishing to participate in our daily live traders chats, simply send a Skype contact request to username ‘stocksumo’. We gladly encourage subscriber participation! WHIPPANY, N.J., Aug. 6, 2015 /PRNewswire/ – Pazoo, Inc. (OTC Pink: PZOO), is pleased to announce that the company has signed a lease to secure a location for its Oregon testing lab facility. BIOC came off of yesterday morning’s extended watchlist making a big move to start the week. The stock traded up from a low of 1.71 and ran as high as 2.95, registering as an intraday increase of 72% on heavy volume in the neighborhood of 17X the 30-day running average. After pulling back slightly into the close at 2.20, BIOC is presently gapping up in the premarket this morning( High of 2.64), so we’re going to keep it on our watchlist for the time being. The idea we brought forth yesterday of monitoring RUSS, which trades inversely with the Russian economy, is probably going to be one that we follow for a longer period of time given the drawn out nature of the events currently playing out in the Ukraine, and how they’re affecting Russia. That being said, we did see some immediate upward price action as RUSS ran into the close, recording a daily trading range from 12.58 – 13.74, a modest, yet solid 9% appreciation on the day. We also want to make note of a proposed joint venture in the works between two companies whose stocks we’ve mentioned in the past: First Solar, Inc. FSLR and SunPower Corp. SPWR. Both stocks began to move on word of a possible IPO for a new vehicle to be comprised of existing assets from each party. We’re going to keep them on watch as we await further updates on the situation. They’re both gapping up further this morning, so we’ll be on the lookout for potential dip-and-rip scenarios caused by profit-taking. In such an event, we’ll be fixating on In-the-money Weekly Calls for options daytrading possibilities.